After 1961, the fiftieth anniversary year of W. S. Gilbert's death, the D'Oyly Carte Opera Company lost its performing monopoly on the Gilbert & Sullivan Operas. 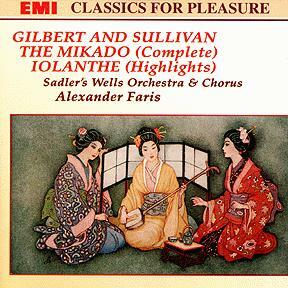 The operas were now free to anyone who wanted them, and one of the first to take advantage was the Sadler's Wells Opera (known today as the English National Opera), which mounted new productions of The Mikado and Iolanthe. Many G&S traditionalists feared that the D'Oyly Carte would be crowded out of existence, but this did not happen. The two Sadler's Wells productions quietly faded away after a few short years of life, while the D'Oyly Carte marched on. Perhaps this recording's most compelling virtue is price: the CD re-issue comes in an EMI "two-fer" jewel box that also includes the Sadler's Wells Iolanthe.